I recently escaped London to take in the crisp, Italian air of Modena for a romantic holiday with my husband. The city completely blew away any expectations I had, so I knew immediately I had to share my experience with you. After all, it feels wrong to have discovered such a gem of a city and not tell others. Modena is in the heart of the Emilia-Romagna region, tucked inland just northwest of Bologna, into which we flew. The flight was an easy hour and 45 minutes from London and then a 30-minute drive to arrive in Modena's city centre. To be honest, Modena has been on my radar for years—probably because it’s the home of Ferrari and Pavarotti (sooo cool! )—but for some reason I mistakenly thought the city was an unattractive, industrial laden place with nothing to offer. I have never been so wrong—shame on me! What finally changed my mind? One of my favourite shows: Master of None. The first two wistful episodes of season two were set in Modena, which followed Dev’s pasta making apprenticeship and gorgeous Italian friends. I was hooked and knew I had to go to Modena ASAP. As it turns out, Modena is amazingly elegant and full of pretty piazzas and Graziosi statues. And most importantly—it boasts some of the best food in Italy (and that’s saying something). It was an absolutely dreamy place to wander for a weekend amongst the beautiful boulevards and colorful buildings. Oh, and the Christmas Markets and decor around the centre was so chic and perfectly Italian. I struggled to find the kind of small boutique hotels I love so much—you know what I’m talking about—something worthy of Mr. & Mrs. Smith, but in old town Modena. The accommodation options were a bit dated, but after searching for what seemed like days, I gave up and booked one of the more traditional options, even though it still didn’t feel right for us. Then, right when I’d thrown in the towel, the hotel Gods threw me a bone and I stumbled upon the divine B&B Quatropiano while reading an article about the city. The B&B is situated on the fourth floor of a traditional building in a perfect old town location with just two beautifully manicured and sweet smelling rooms. The linen sheets and firm pillows were heaven and made for an amazing night’s rest. Our host, Antonio, also owns the very chic Mon Café, which is where guests eat breakfast. I can’t say enough about this B&B. It helped make the trip! Lunch was had at Il Fantino. Our B&B host scribbled the location of this wonderful restaurant on a map and told us to go for some traditional local food. With no reservation, we were very lucky to snag the last table—there was a long queue out the door shortly after our arrival. We drank Lambrusco and enjoyed one of the best pasta dishes of my life—Gnocchi with pumpkin and sausage. Apparently, the region is enjoying its best harvest of pumpkins in years due to a very dry summer with only 4 days of rain. This meant the pumpkins didn’t take on water and their flavour is rich and perfectly balanced. Who knew?! Now for coffee—a very important detail of any quick trip. We took our afternoon espresso at the elegant bar Caffetteria Drogheria Giusti at Via Luigi Carlo Farini 71. Definitely recommend. For dinner, we went to Franceschetta 58, which was about a 20-minute walk from our B&B. This is Massimo Bottura’s other restaurant and is significantly cheaper—and easier to get a reservation than its sister restaurant, Osteria Francescana (this is said to be one of the best restaurants in the world). Franceschetta 58 is modern and fun—it kind of reminded me of a neighbourhood restaurant in Melbourne, which of course I loved. We ordered the “I Love Modena” tasting menu and enjoyed 7 courses (! )—including creamed cod, chickpea purée, hazelnuts, “crusco” pepper & mushroom broth, and the Emilia Burger by Massimo Bottura himself. To put it into perspective a little more, the girl at the next table photographed her every course. It’s that kind of place. Oh, and I loved the Spotify playlist they had on (always an important detail)! 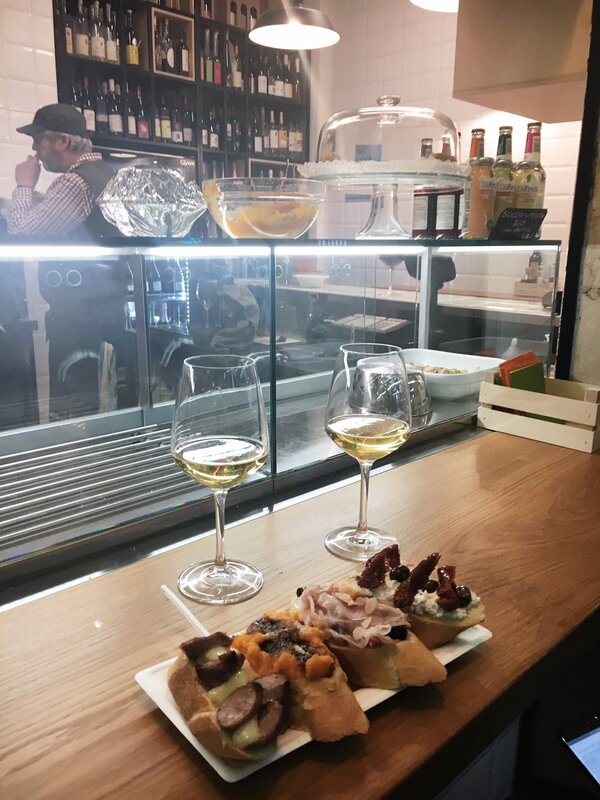 If you’re looking for a nightcap after dinner or drinks before, we squeezed in an aperitif at Archer at Via Cesare Battisti 54—a fabulous wine bar (also featured in Master of None). Have I ever told you all that I love a good food market? Mercato Albinelli is a fabulous covered market selling fruits, vegetables, cheeses, meat and fish. I was fondly reminded of the Adelaide Central Market in my hometown, which of course struck all the right chords. Mercato Albinelli also has a number of casual dining options for a glass of Lambrusco or a light bite. We took our time and enjoyed wine and bruschetta while sitting at the bar at Osteria Sa Ghe. Next, for the bargain price of €2 you can take a tour of the Municipal Balsamic Vinegar Factory and sample vinegar that is 12 and 25 years old. This is pretty good value when you consider these products retail at €50 and €75 for a tiny bottle. The tours are usually conducted in Italian (unfortunately my Italian isn’t quite up to scratch yet), but we were very lucky to be taken care of by the lovely Elisa, who hosted us in English. She also has her own balsamic vinegar factory and continues her father’s tradition of balsamic production (how beautiful is that?!). Her passion and enthusiasm for the perfect balance of acidity and sweetness of this syrup was contagious. If you’re up for some exercise, you can climb up the Ghirlandina tower for amazing views of Modena. Unfortunately, it was closed for refurbishment during our stay, but I can confirm the exterior of the tower was spotlessly white! Balsamic vinegar—of course. Modena is well-known for its production of balsamic vinegar, which is why touring the Municipal Balsamic Vinegar Factory is such a great, local thing to do. Last, but certainly not least, make sure to take home some Amaretti—the famous light almond biscuits, which are very popular throughout the city. Modena was so much more than I ever expected and I’ll forever be grateful to Master of None for convincing me it was worth the visit. I thoroughly recommend the city (and the show)!